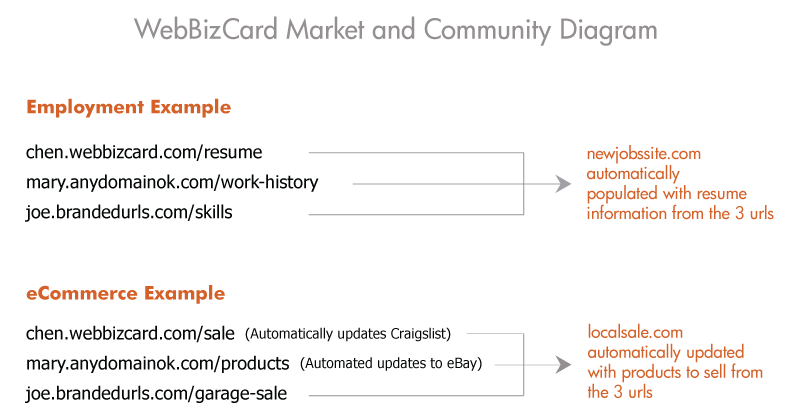 »» What can WebBIZcards Do? WebBIZcard URLs are the most effective way to communicate individuals' representation and information. WebBIZcard can also use www.Domain.com/Name/profile URL syntax can also be used but is less efficient in communications. WebBIZcard can exchange data using both URL syntaxes. Instead of having many web handles and web addresses at numerous websites, particularly social networking websites, WebBIZcard enables one permanent web address that will enable you to link to all the others. See sample here. WebBIZcards can carry exchangeable data; for example, if the URLs Chen.WebBIZcard.com/resume, Mary.AnyDomainOK.com/work-history , and John.BrandedURLs.com/skills were inputted into NewEmployment.com, Chen's, Mary's, and John's resumes information would be automatically inputted into NewEmployment.com, thus creating a new marketplace. Their resume information can also be automatically inputted into well-known employment websites such as Monster.com or Dice.com. Similar to the resumes example immediately above, URLs representing products databases can automatically update to Craigslist and eBay. Similarly for dating, dating status databases can automatically update Match.com and others. Other uses include social networking, classifieds, blogs, industry directories, vertical industries exchanges--anywhere an individual's representation is used. Click these links to learn how WebBIZcard applies for your industry. Why type in contacts information into a standard contact manager (e.g. Outlook). Send a Outlook user one of your WebBIZcard URLs, and he or she will be able to automatically download your URLs' data into his contact manager. For example, Chen sends Chen.WebBIZcard.com/biz to Mark, and Mark inputs this URL into his contact manager; then data from Chen.WebBIZcard.com/biz will download into Mark's contact manager. If Chen sends Chen.WebBIZcard.com/contacts to Jane, Jane load Chen's "/contacts" webpage information into her Outlook.